Automated filter membrane particle counting and sizing system with advanced image analysis and microscope automation, covering whole or user specified areas of filters. Complies with the international standard ISO 4407 and provides rapid and accurate contamination results to the following standards: SAE AS 4059, NAS 1638, ISO 4406 and ISO 16232. Portable particle counter for hydraulic oil, lubricating oil and fuels, for batch sampling and online measurements. Results to ISO 4406:1999 4µm(c), 6µm(c), 14µm(c) based on calibration to ISO 11171; or results to ISO 4406:1987 2µm, 5µm, 15µm based on ISO 4402. Portable particle counter for process water, waste water, potable water, organic fluids, corrosive fluids and parts cleanliness control. Used for research and standard measurements in laboratories and test institutes, for indoor and field applications. Calibration according to ISO 21501-3. Portable particle counter for batch or online sampling of water-based hydraulic liquids (Water-Glycol), e.g. for hydraulic systems in the offshore oil and gas industry. SAE AS 4059, 6 channels A – F, 4 – 70µm(c) or 5 channels B – F, 6 – 70m(c), calibration fully according to ISO 11171; NAS 1638, 5 – 100µm. 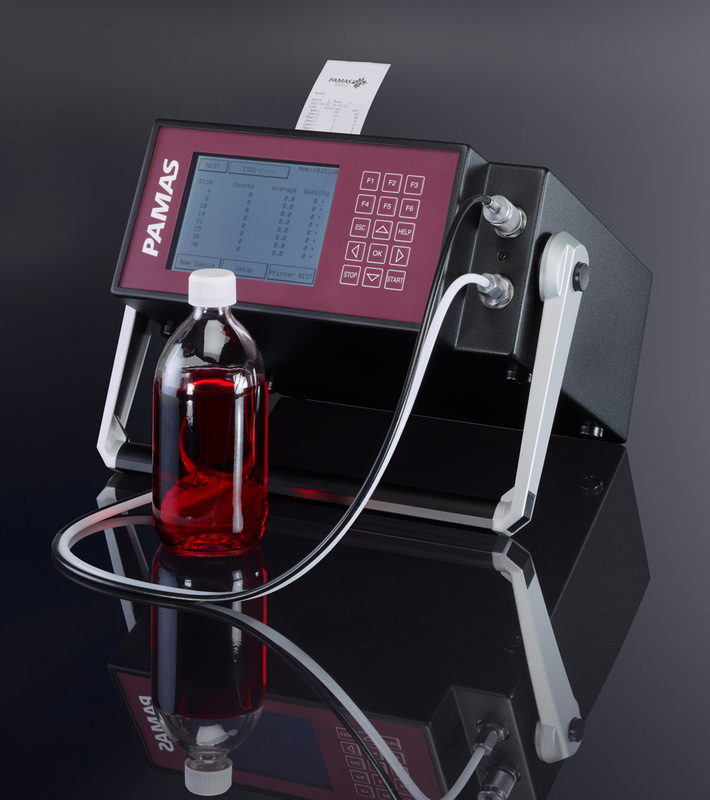 The PAMAS S50P Fuel online particle counter is a cost effective fixed installed measuring instrument for the condition monitoring and contamination analysis of liquid fuel. Reference quality laboratory particle counting system for batch sampling of water-based, organic-based, mineral-based, pharmaceutical (USP), viscous and corrosive fluids. Volumetric cell design of PAMAS sensors guarantees highest accuracy and resolution for best statistical information. Calibration according to ISO 11171, ISO 4402, ISO 21501-3. Reference quality laboratory particle counting system for pharmaceutical applications (control of parenteral fluids, infusion solutions, ophthalmic & oral fluids, using USP software if required) and other liquids of low viscosity (e.g. water, IPA). Sample volumes from 100µl to 1000ml. Calibration according to ISO 21501-3.